I don't understand why Cocoon has released some remixes of a track that is 5 years old. Beside that those remixes aren't great at all, none of the 2 remixes contains a recognizable part of the original track, it's more like Freeform Five remixes Scan X own remix from Club You. 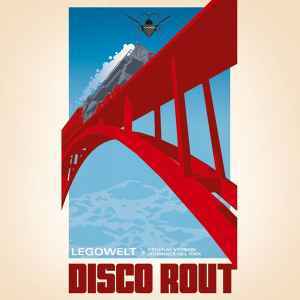 I think not much remixes will beat that Johannes Heil remix from Disco Rout. The only reason why you should buy this 12" is to have the original mix. The track 'Disco Rout' was created/produced around 1998/1999. Around that time Danny Wolfers released a record named 'Pimpshifter' under his Legowelt Alterego. Because of the fact that he was of the opinion that the track wasn't good enough for this album he didn't released it on this record. Later on Ghostly International asked him if he could deliver a track for their 'Tangent 2002' CD and records. Because 'Disco Rout' still wasn't released, he decided to give this track to them. Although he had the opinion that the track wasn't good enough, it became a big hit after Cocoon Recordings licensed the track from Ghostly International. In 2002 'Disco Rout' was voted 'track of the year' by the German music magazine Groove. What a stunner! I only recently discovered it while looking for some electro tracks. It really keeps you going the whole 5:41, and it has some cool lyrics, too (from Milano to The Hague, easy as it goes...). It's one of those tracks you can listen to over and over again, without getting bored. Techno 4 Sale by Supreme-Headz-Ent.